Even the new methodology to measure student academic attainment cannot hide the persistent underachievement of black Caribbean students in our school system. 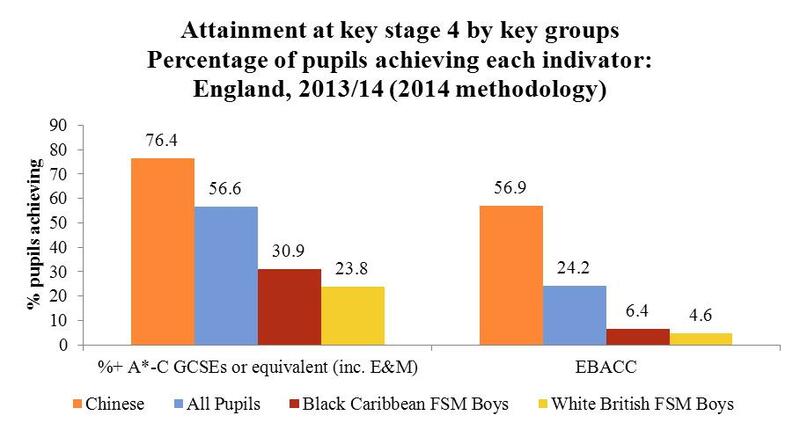 Once again, black Caribbean students rank at the bottom of England’s GCSE attainment league table. 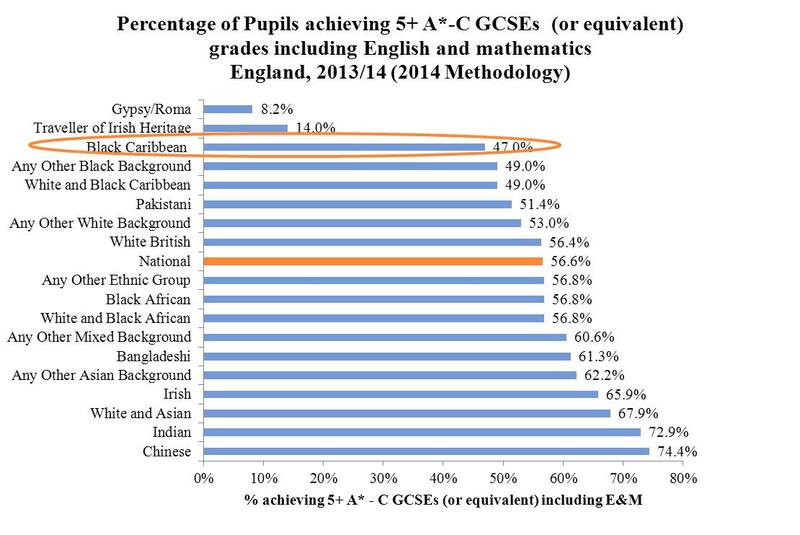 Only 47% of black Caribbean students achieved at least 5+ A*- C GCSEs under the new 2014 methodology measuring grades. This was ahead of only Traveller Irish and Gypsy/Roma students, where only 14% and 8.2% respectively attained the government benchmark. The 2014 percentage of black Caribbean students attaining the government GCSE benchmark is 5% lower than the 2012/2013 academic year; however, this was in part due to the Department for Education’s new criteria where exam retakes and IGCSEs were not considered in the final grades. For the first time, however, Black African ranked above the national average for GCSE attainment and 0.04% more black African students achieved the government benchmark of 5+ A*- C GCSEs compared to white British students. 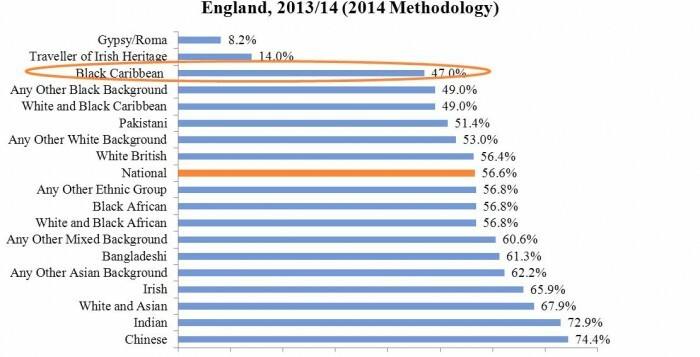 White British students also (for the first time that we can find) ranked below the national average in GCSE attainment. In 2013/2014, 30.9% of Black Caribbean boys on Free School Meals achieved the government benchmark, while only 23.8% of white British boys on Free School Meals achieved the same. Both groups remain below the national average by 25.7% and 32.7% respectively. African & Caribbean Diversity welcomes the new methodology for measuring pupil attainment in GCSE results as it does away with schools who were allowing students to take less rigorous exams and schools who would push students to challenge a GCSE too early and then retake the exam (sometimes multiple times) to raise their grades. Nevertheless, the new methodology emphasizes the stark differences in the academic attainment (as measured by the government’s GCSE benchmark) between black Caribbean students and students from other ethnicities. While the government is seeking to provide a holistic approach towards raising student attainment, and streamlining GCSE exams, new initiatives including further enrichment and community support needs to be put in place to help raise the attainment of disadvantaged students especially black Caribbean students and more specifically black Caribbean boys. This becomes even more pertinent when considering that this demographic is more likely to be unemployed after key stage 4 and is makers up a higher proportion of England’s prison system. Work with local charities and community groups to increase access to education and implement initiatives and programmes that have shown to improve academic attainment for students from disadvantaged backgrounds. Active collaboration between government and community groups is one way to ensure that all ethnic groups are achieving the national key stage 4 benchmark.